The Adaptec SCSI Card 29320A-R is a half-size, 64-bit 133 MHz PCI-X, single-channel Ultra320 SCSI card with integrated HostRAID. The Adaptec 29320A-R includes a legacy SCSI connector and is a cost-effective RAID 0, 1 and 10 solution. In addition, the Adaptec 29320A-R offers new drivers for HostRAID, both Linux and Windows Server 2003, as well as the same browser-based management tool used by Adaptec RAID products. The Adaptec 29320A-R provides data protection at the fastest SCSI speeds available up to 320 MByte/sec, ideal for mainline storage, streaming video and audio, and other bandwidth-intensive applications. 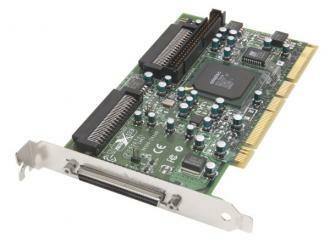 The card has a 68-pin HD external connector and a 68-pin HD internal connector for Ultra320 SCSI (LVD) hard disks drives and a 68-pin/50-pin legacy SCSI connector. The 29320A-R offers an unparalleled degree of investment protection and upgradability to Adaptec's entire SCSI RAID family of products.